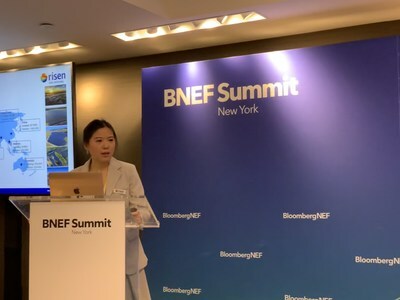 NINGBO, China, March 28, 2019 /PRNewswire/ -- On March 25, 2019, Risen Energy Co., Ltd. overseas investment and financing director Zhang Jieling attended the annual BNEF Summit in New York and presented the company's new plans for solar energy financing in 2019. Ms. Zhang said, "As the securitization of solar assets is on its way to becoming the next hotspot in solar project financing, Risen Energy is now actively planning the securitization and expect to begin the whole process in the fourth quarter of this year. Risen Energy's core competences include more than a decade of experience worldwide as an independent power producer, overseas teams with international competitiveness, professional experience in project development, project financing, investment and EPC and more importantly, solid and reliable relationships with financial institutions across the world." When commenting on the benefits of asset-backed securities (ABS), Ms. Zhang said, "Pooling the assets into securities allow the issuers to remove the specific assets from their balance sheet and also isolate investors from the group's operational risk. In addition, ABS provides investors, who were exposed to only standardized assets, with access to a wider range of industry-related and business opportunities. These capital markets offer longer-term and lower-cost funds. The lower financing cost associated with ABS accelerates the reduction in the leverage cost of raising funds using energy assets and increases the competitiveness of PV power when compared with other types of energy." Ms. Zhang also shared Risen Energy's future planning and its appeal to the capital markets, "Risen Energy will expand its solar projects in Australia, Latin America, the Middle East and Africa, as well as introduce our energy storage solutions into markets where the grid is relatively weak, helping the company enhance its industrial and international competitiveness across the solar energy value chain. We believe the addition of energy storage will be attractive to the capital markets, noting in particular that the majority of investors have seen that supplementing the PV system with an energy storage solution has increasingly become one of the key trends in the industry. We hope to expand our relationships with financial institutions with the aim of creating an effective leverage for our investments with lower-cost funds." Risen Energy will be one of the first solar module manufacturers to put the idea of offering solar assets-backed securities into practice.